The Nocloini are a superficially diverse assemblage of genera and species biogeographically centered in the southwestern United States and Mexico. 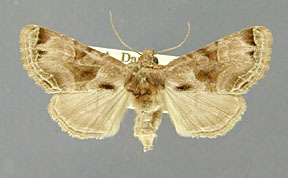 Some genera of the tribe look very "noctuid like" with the normal maculation and brown and black coloration. Others are more colorful. For example the New Genus Nocloini New Genus 2 has many bright yellow species. 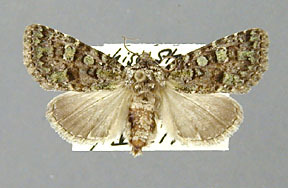 The genus Lythrodes is small with elongate cream-yellow forewings with red stripes. Redingtonia alba has an elongate, rectangular pure white wings. All of the members of the Nocloini, however, are united by one easily seen synapomorphy. The tarsal segments of the prothoracic legs are very short and the tarsal claws very large giving the leg and short and stubby appearance. A number of the characters of the Nocloini are discussed below in a tabular form rather than producing a formal description for the tribe. 1. The most distinctive feature, and the defining synapomorphy, of the Nocloini is the structure of the prothoracic tarsal segments. The tibia and tarsal segments, overall, appear very short and stubby. The tarsal segments are about as long as wide except for the first which is twice as long as wide. Some variation among the genera of the tribe exists, but all species of the Nocloini have the short, stubby tarsal segments. The tarsal claws are very large relative to the tarsal segments. The paronychia are also very large, trapezoidal and bear many large spines along their outer margin. The puvillus is well developed and has a dark ring at its base. The usual two dorsal-apical setae of the fifth tarsal segment as are large and long. The first four tarsal segments are scaled dorsally and ventrally and the tarsal spines are arranged in three, sometimes irregular rows. The spines in the outer rows are particularly well developed. The first tarsal segment is naked below and the tarsal spines, although well developed, are irregularly arranged. The prothoracic tibia is two to three times longer than wide and the entire prothoracic leg has a short, stubby appearance. There is no tibial claw or tibial spines. 2. A frontal process is present in all genera, although it may be greatly reduced and nearly absent, or strongly modified. The typical, and presumably plesiomorphic, state consists of a round outer, raised ring with a central protuberance. The outer ring is typically interrupted at the center of the dorsal margin and on each of the lateral sides. Many modifications of this basic structure occur. A common modification is for various stages in reduction of parts of the frontal process. The ventral margin is often greatly reduced or absent making it appear as if the lower margin of the outer ring is confluent with the projecting clypeal margin (e.g. Nocloa). In a further reduction the lateral sides may disappear. In the smaragdina species group of Paramiana the outer ring is completely absent and only a small central protuberance remains. A second line of modification is for the outer ring to shrink in size and for the interior to be filled eliminating or nearly eliminating the central protuberance. This reduced outer ring may be triangular (e.g. New Genus 3) or elliptical (e.g. Oslaria). Another line of modification has the central protuberance become a vertical shelf running between the dorsal and ventral margins of the outer ring (e.g. Lythrodes) and in its most extreme state the the central protuberance is elongate and fused with the tridentate ventral margin of the outer ring (Redingtonia). 3. The eyes are never hairy, ocelli are always present, and lashes from the base of the antenna and the rear margin of the eye may or may not be present depending on the genus. The male and female antennae are simple in all genera except Petalumaria. 4. Abdominal tufts are restricted to a single tuft on the first abdominal tergum or absent. 5. Male basal abdominal hair pencils and Stobbe's Glands are present or absent depending on the genus. 6. The forewing venation has R3, R4, and R5 arising from a common stalk about one-fifth of the distince from the apex of the accessory cell to the apex of the wing. Veins R3 and R4 are stalked about two-fifths of the distance from the end of the accessory cell. 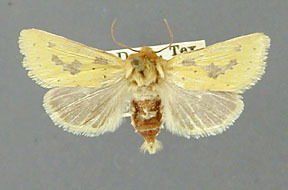 The forewing venation is otherwise as in the Psaphidinae as a whole. Vein M2 of the hindwing is relatively weak, weaker than in the Psaphidini and Triocnemidini and arises from about the middle of the cell. The cross veins ldc and mdc are not inangled as in the Triocnemidini, nor is the medial vein present in the cell. 7. The seventh male tergum may be enlarged, more heavily sclerotized than the other terga, and with the caudal margin swollen, a feature shared with the Psaphidini and Triocnemidini. The seventh tergum, however, shows all stages of development in the various genera of the tribe, from slightly enlarged to not enlarged at all. The enlarged state is assumed to be plesiomorphic for the tribe. 8. The eighth sternite is u-shaped with a central ridge of hair- like setae. Lateral apodemes are absent in all genera except New Genus 5. 9. The uncus of the male genitalia is typically swollen, hairly dorsally, and with an apical hook, a general character shared with most of the Psaphidinae and the Stiriinae. Uncus length is variable among genera. 10. A free pleurite is always present, unmodified, and broadly fused with outer, dorsal margin of the tegumen. 11. The valve is elongate, rectangular and very simple. A true corona is absent and the apical third of the valve is covered with elongate setae. These setae come close to forming a corona-like structure in Nocloini New Genus 5 dissimilis (Barnes and McDunnough). A digitus is absent. The clasper is simple and oriented perpendicular to the long axis of the valve (as in the Psaphidinae as a whole). The clasper is variable in developed. The clasper is well developed, long, and slightly s-shaped in Paramiana. In some genera the clasper is much smaller and shorter. 12. The transtilla is variable in development, well developed in some genera, but degenerate in others. The anellus is always spinulose and in New Genus 2 the spinules are relatively large and appear almost peg like. 13. The juxta is a simple quadrate plate. The caudal margin of the juxta may not be distinct from the anellus. 14. The vesica is always armed with spine-like cornuti typically (but not always) arranged in groups. Most commonly the cornuti arearanged into one larger group and a second smaller group opposite the larger group. The bases of the spine-like cornuti are almost seated in a partially sclerotized, corrugated part of the vesica membrane. The combination of the long spines and these partially sclerotized regions makes everting the vesica of many of the species very difficult and it can be nearly impossible for the smaller species. The basal portion of the vesica is always covered with spinules, although the number of spinules is variable among genera. 15. The ovipositor and ovipositor lobes are variable. In some genera the ovipositor and the apophyses anteriores and posteriores are extremely long (e.g. Ruacodes), although in most genera the ovipositor is of normal developed. The ovipositor lobes in some genera are normal or even slightly degenerate and membranous. In other genera the lobes may be heavily sclerotized and pointed at their apices (e.g. Nocloa). 16. The female ostium is always membranous and not distinct from the intersegmental membrane between the seventh and eighth abdominal segments. This character is shared with the Psaphidini. 17. The female bursa in most genera is ovate with the appendix bursae projecting to the right (in the vertical orientation of the figures) as a lobe or triangular projection. A few other genera, however, have a radically different configuration of the bursae. Most commonly the the appendix bursae and the ductus seminalis is oriented in a caudal direction. In these genera the ductus bursae may be broadly fused with the appendix bursae and it may not be clear what the relative contributions of the corpus bursae, ductus bursae, and appendix bursae to the total bursa are. The most extreme form of modification occurs in New Genus 5 where the appendix bursae and ductus bursae together form a large, ovate bursa with an large internal sclerotization. The corpus bursae of New Genus 5 is reduced to a small ovate outpocketing of the cephalad margin of the bursa. 18. The internal tympanic region is basically the same as in the Psaphidini. Pocket I is triangular. Pocket two is present and strong and pocket III is also strong with a large, circular opening. Pocket III is not fused to tympanal air sac. Pocket IV is small with a small dorsal, triangular opening. The posterior tendon plate absent. 19. The larva and foodplants are unknown for all genera and species of the Nocloini.